Joan says she really enjoyed making this basket--the hardest part was starting the first row and getting the weaver just where she wanted it. This was the first time she tried the 3-strand braid for her rim filler. Using the round reed was a pleasure and Joan says she would like to have time to make more of these baskets. 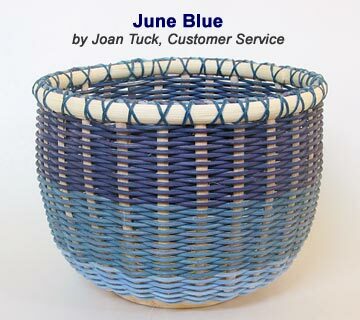 Calculate Supplies for 1 to 20 June Blue baskets with the Basket Supply Calculator. The Supply List gives you the least expensive way to purchase the supplies for your quantity of baskets. View on-line or print to your printer. Soak your reed materials for a few minutes in warm water to make them pliable. Do not soak the wooden base. Joan sanded her slotted base then cut 27 spokes 8" long from 1/4" Flat Oval, inserting them around the base evenly. Beginning with the #2 Round she wove about 7 rows and then used #3 Round in 3 different colors of blue (sky blue, Amish and navy blue) to complete the basket. Above the final row of #3 Round is one row of 1/4" Flat which is covered by the rim. Every other spoke is cut and tucked to the inside; the remaining spokes are trimmed off. Joan used a 3-strand braid of #3 Round dyed reed as her rim filler and 3/8" Flat Oval for rims. A double strand of waxed linen was used and the rims were double lashed--tying off the waxed linen on the inside of the basket when the lashing was completed. Try your hand at this easy project with one of our new slotted wooden bases. Choose from round, oval, square, rectangular or oblong. Cut spokes a couple of inches longer than the height of your basket, add rows of plain or twill weave and finish with standard rims and lashing. Enjoy the creative adventure!